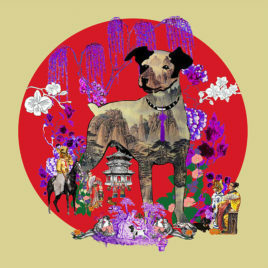 Fiona Hollis Carney has successfully merged lots of Feng Shui elements in this “Year of the Dog 2018” picture. Relationships were very important in the year 2018 and seeing the Dog’s secret friend (Rabbit) and allies (Horse and Tiger) in this picture makes it all the more powerful. Scenes of couples and people being together further enhance the message of friendship/relationships. 2019 is a very good year to start a new business or expand your existing business. Use the power of the Dog by displaying the Dog in the NW of your home or office to bring you new alliances. These will be very useful! 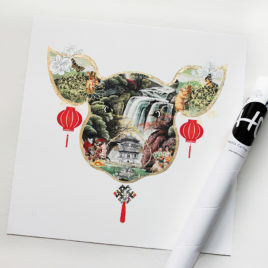 In summary, the “Year of the Dog 2018” print can be a very effective for the following: • The Rabbit – secret friend of the Dog • The Horse and Tiger – allies of the Dog • Anyone who would like support to start or expand their business in 2019. • All Dog lovers! Any orders placed via Feng Shui Focus will receive a 10% discount on the regular price of the fine art print. Please contact Fiona directly via e-mail at fiona@holliscarney.com and quote “Feng Shui Focus” to receive your discount when placing your order. I invite you to go to Fiona's website www.holliscarney.com to discover the art yourself. I often recommend to my clients to activate their secret friend because this can be very useful in many different situations, eg: to gain support at your work place or bring helpful people into your life who can boost your career or open new doors for you. Activating the secret friend can also help your children with their friendship luck, especially at the beginning of a new school year or if they change schools. The Laughing Buddha is a well-loved Feng Shui symbol and will be a wonderful addition to any home. He removes all your worries and his smile is so infectuous, you won’t be able to help yourself and smile back at him! The “Happy Laughing Buddha” also helps to suppress conflict energy and brings peace and happiness to you and your home. He can help anyone who is entangled in angry situations with colleagues, superiors, family members, or who is a victim of court cases. 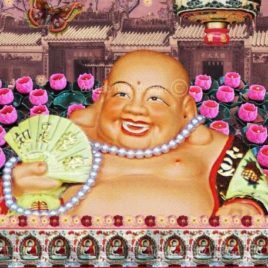 In 2019, the Laughing Buddha is particularly helpful in the following situations (but not to be hung in a bedroom): • In the EAST to subdue the Yearly Conflict Star • In the NW to subdue the Yearly Killing Star • In the SOUTH to counter the annual No 3 Quarrelsome Star • Facing your main entrance to prevent negative energies from entering. From S$440.00 Please note that the “Buy Product” button will take you straight to Louise Hill’s website where you can purchase the artwork. Michelle Ma has created a series of “Iconic Prominent Female Portraits” where she introduces a number of Chinese ladies who impacted the history of China in their very own way. Some were historic personalities, others were activists or revolutionists who led extraordinary lives. What they all have in common is the fact that they had a very strong character. Most of my Feng Shui clients are female and are turning to the power of Feng Shui to safeguard the well-being of their family. Many of the ladies also wish to strengthen their own luck, their position within the family, be more confident, and achieve their own success in their chosen field. 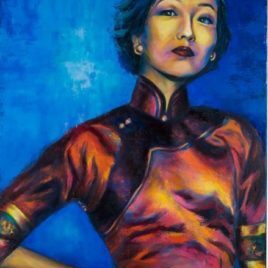 This is where a painting or picture of a strong, successful female person, like this portrait of Eileen Chang, will be extremely helpful! Any orders placed via Feng Shui Focus will receive a 10% discount on the regular price of the fine art print. Please contact Michelle directly via e-mail at michelle@michellemaart.com and quote “Feng Shui Focus” to receive your discount when placing your order. Symbolism plays a very important role in Feng Shui. Visualisation is another powerful tool to help you achieve your goals, whatever they may be. Having the words of your wish/desire written down is the unbeatable combination of both – symbolism and visualisation. Now all you need to do is hang your personal Calligraphy in the right place of your home to help transform the intangible energies into visions of reality. 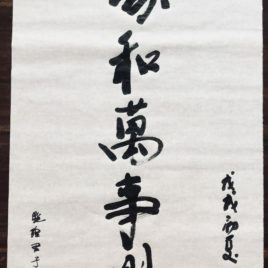 Any orders placed via Feng Shui Focus will receive a 10% discount on the regular price of the Calligraphy art piece. Please contact Michelle directly via e-mail at michelle@michellemaart.com and quote “Feng Shui Focus” to receive your discount when placing your order. Here in Asia, the Buddha is a very popular and much loved symbol of peace, serenity and wisdom. Figures and images of the enlightened Buddha take centre stage in many homes and public places. In 2019, I can see this painting/fine art print working wonders in the SOUTH sector of your home (but not in a bedroom), as this is plagued by the annual Conflict Star. As the name suggests, the Conflict Star brings aggressive energy, causing arguments and fights that can easily escalate into violence. You need strong fire energy to subdue this affliction. This could be a bright light or, in fact, a red painting! 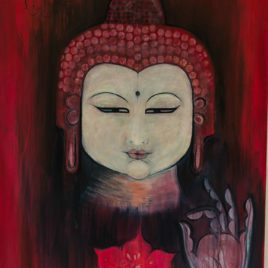 The Scarlet Lotus Buddha has both – the fiery red colours that subdue the tension and aggression and the peaceful Buddha who restores harmony and love. In addition, you will strengthen the energy of the SOUTH in a positive way as the SOUTH belongs to the fire element. £249.00 GBP Please note that the "Buy Product" button will take you directly to the Clare Haxby website. I am a strong believer in activating your friendship luck. Whether you are a child/student changing school or an adult starting a new job or moving into a new department – having helpful people in our life is what we all need! 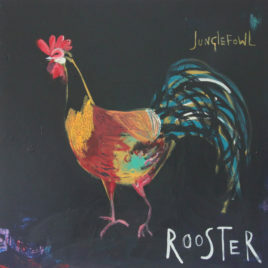 This is a very friendly looking Rooster which in my opinion makes it particularly appealing for children. Of course the warm and bright colours add to the harmony of the picture. 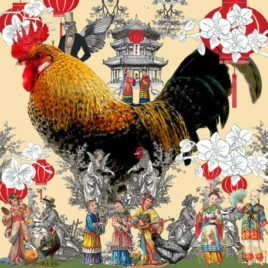 The Rooster is also a very popular symbol to ward off negativity and office politics. Please note that the "Buy Product" button will take you directly to the Clare Haxby website.